Can Lukaku catch Salah, Kane and Aguero this season? Such is the velocity at which the narrative in football moves, the concept of Romelu Lukaku being the most expensive striker in the world, a Manchester United player and all that entails almost feels as something for the club archive. There is considerably more going on at the football club of concern, which is a good thing for the Belgian following a good but not great debut season, as the pressure of focus has been alleviated somewhat. And unlike Paul Pogba, he isn’t an individual to demand the spotlight on himself. But having a full campaign under his belt, where he scored 27 goals in 51 games across all competitions, averaging a strike every 179 Premier League minutes, means any semblance of a honeymoon period is over. The patience afforded by fans over a new signing has eroded – they know what to expect and Lukaku must continue to deliver, and improve. He finished last season as the sixth-highest scorer in the Premier League, a solid position given he ranked outside the top ten attacking players for scoring attempts (26th), touches in the opposition penalty area (31st) and expected goals per 90 minutes (12th). Our friends at Football Whispers assess how Lukaku can catch the division’s leading marksmen, Tottenham’s Harry Kane, Mohamed Salah of Liverpool and Manchester City’s Sergio Aguero, and be in contention for the Golden Boot this season. The summer proved a fraught one for United despite so much positivity throughout June. But for Lukaku it was confirmation of his position as the club’s primary attacking force. No attacking players came through the Old Trafford door and Jose Mourinho’s declining relationship with Anthony Martial slipped further into a downward spiral. Lukaku only really has two contenders for the central striker role: Alexis Sanchez and Marcus Rashford. In Sanchez’s case, he’s almost exclusively been used by Mourinho in a wide role, with pretty average results, and Rashford hasn’t been let off the leash by his manager who has tended to use him either as an inside forward or wide attacking midfielder. Lukaku has been durable throughout his career and assuming he continues that trend, having averaged 31 league starts per season since becoming a first-team player at West Brom in 2012/13, should match Kane and Salah for minutes. More games means more opportunities, which should lead to more goals. It’s a fairly simple equation and in Lukaku, United and Mourinho trust once again. The problem for the 25-year-old is that, unlike Tottenham and Liverpool, is he’s playing for a manager who doesn’t embrace the same level of attacking abandonment. Over the last two seasons under Mourinho, United rank sixth in the Premier League for scoring attempts per game (14.35), fifth for big chances created (1.55) and fifth for xG per game (1.56) – with the Portuguese at the helm they simply haven’t been an elite offensive side. In terms of a supply line to Lukaku, the only United player in the top 10 last season for big chances created or open play key passes was Sanchez, with 50 per cent of his work with Arsenal. All this contributes to the Belgian being outside the top ten for so many striking metrics. So far, so negative. But that’s not to say Lukaku can’t improve the rate at which he scores. That he was just outside the top five speaks volumes for his ability. And while his first touch might not be of the level of Aguero’s, his pace not the same as Pierre-Emerick Aubameyang or Salah or his overall build-up not as varied as Kane, he remains an excellent striker. One whose shooting accuracy of 50 per cent was better than Salah (47.2), Kane (41.3), Aguero (45.7), Jamie Vardy (49.2) and Raheem Sterling (41.3) – the five men who finished above him in the scoring charts last season. 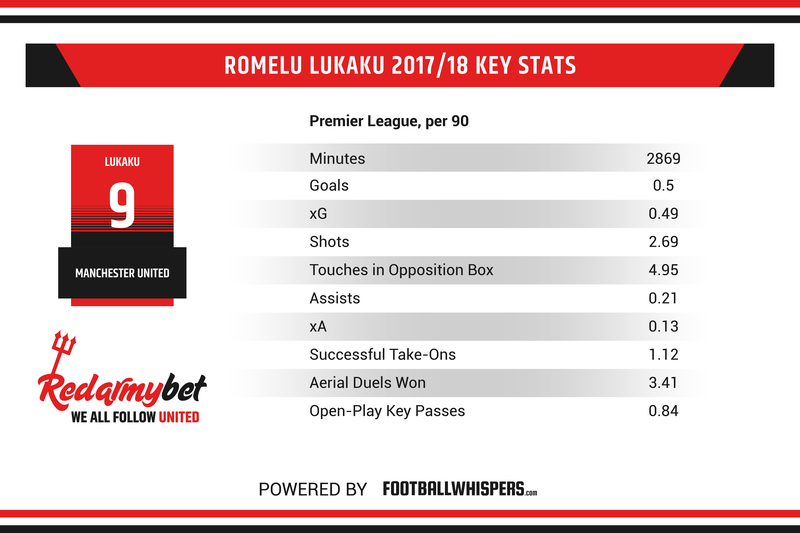 While it may seem Lukaku misses more than he should, in reality he’s an efficient shooter who did extremely well with the relatively limited chances presented to him. 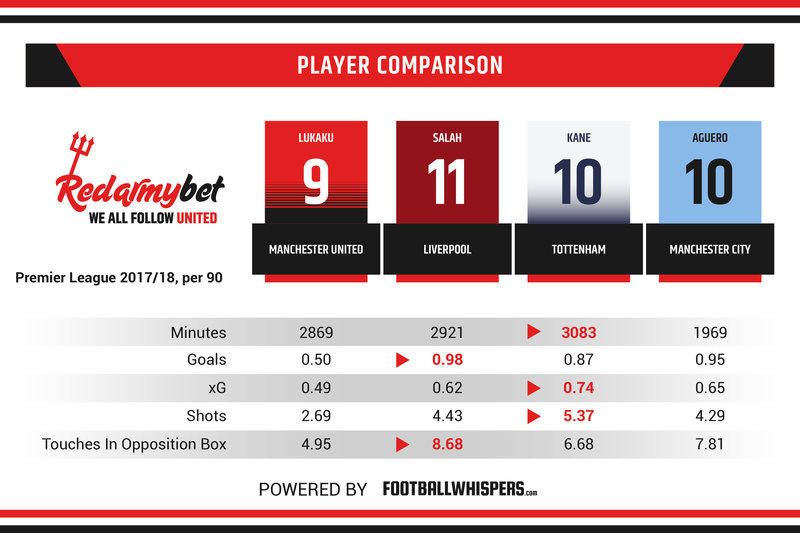 Kane (5.37) and Salah (4.43) were No.1 and No.2 in terms of total scoring attempts per 90 minutes last season, with Lukaku way down on just 2.59. Getting the ball to him in more advanced positions should be of paramount importance and there are some reasons to be positive, albeit with the backdrop of Sunday’s performance at the Amex Stadium. Pogba has, in places, looked a more willing and consistent attacking force than the restrained version of him throughout much of 2017/18. With Fred gradually finding his feet and providing additional legs in the midfield, it should free the Frenchman further. Luke Shaw’s reintegration into the first-team is also pertinent. As good as Ashley Young was last term, his lack of a left-foot was an enduring frustration, particularly in the attacking third when he’d check back onto his right in crossing positions. With a natural left-footer in that position – and until Mourinho properly figures out Sanchez’s role, it’ll be a main source of width – Shaw presents the opportunity of more crosses being delivered on the front foot, which strikers of Lukaku’s ilk prefer. It should be (somewhat worryingly) noted that Shaw is yet to deliver a single cross this season but it’s an attacking weapon, United can really profit from, if he’s permitted to get forward enough. This is all hypothetical, but what is certain is this: Lukaku is a striker who is perfectly capable of challenging Kane, Salah and Aguero at the top of the scoring charts, if Mourinho allows United to put him in the right positions more regularly.